ANN ARBOR, Mich. — At one point, 95 percent of the camp was already in the fieldhouse. Fewer than five campers were still in line to field a flyball and a grounder each before going in for lunch. Or, to be more accurate, it was three or four kids, and Jim Harbaugh. The Michigan coach saw them through the drill—another test of athleticism at this specialized quarterback camp—and then (of course) put a glove on himself, misjudged a flyball and fielded a grounder cleanly before coming over. This wasn’t for show, either. Just about no one was left in plain sight. Eighteen months removed from his time as an NFL coach, Harbaugh is in his element at his alma mater. He’s become an almost-daily newsmaker in college football, put together a 10-3 debut season in Ann Arbor, and doesn’t hesitate when I ask about how happy he is at Michigan. We’re now well into the NFL’s dead period, so this week we’ll look forward to simmering contract situations (and one that may be dead in the water), check in on change in Detroit, and look at how staff shakeups affect contenders. But we start in a place where different levels of the game came together last weekend, and where we ended up getting perspective on the health of the sport. Since it’s summer, and the way coaches are spending their summers has been a hot-button topic in college football, our video producer, John DePetro, and I traveled to see what the noise is about. That put us here, in front of Harbaugh, at a 240-player quarterback-only camp staffed by Jay Cutler, Zach Mettenberger, two NFL offensive coordinators and about a dozen other NFL assistants. But of the lessons he shared with me, it was one he got from the kids that interested me most, and it’s one pertinent to all levels of football. “I think a lot of people are starting to wonder, you read articles, you see movies, criticism of just the game of football,” he said. “But the game is so much stronger than it was five years ago, when I was at Stanford. Now, I’m out traveling the country, seeing the love these guys have for the game of football. They really like football. And they’re so much better. In March, Jim’s brother/Ravens coach John Harbaugh launched into a passionate defense of football on camera with our guy Peter King, and Jim certainly went back over some ground that his sibling already covered. In fact, one line from Jim—“I’ve never heard a guy who played high school football who, at the end of those four years says, ‘I wish I hadn’t played football’”—was almost verbatim. But there is an important distinction to be made here: The younger Harbaugh brother, now as a college coach, is around the high school and youth levels of the game on a far more consistent basis. So he has richer context now than he did while he was in San Francisco, or than his brother does. And Harbaugh says his proof is out there on the fields, both here and elsewhere, where his coaches are participating in about 40 camps this summer. What he’s seen, he says, is enough for him to declare definitively that he’s not worried about the game’s future, like so many other people are. All of these camps are a pretty good example of that—and we’ll have more on the camps themselves in the coming days—since they’ve attracted a pretty good crowd no matter where they’ve been held. And as for Harbaugh himself, I can tell you, first-hand, that he does look like (to borrow his terminology) a pig in you-know-what. Of course, his NFL success means the NFL will keep knocking on his door. But when I ask whether he misses the league, Harbaugh keeps emphasizing how happy—he won’t use the word “content,” because of its connotation—he is here. “It’s not like I ‘miss’ the NFL, because it didn’t go anywhere,” Harbaugh says. “I get great enjoyment watching, and I’m a diehard watching my brother, his team and what they’re doing. There are things not coaching in the NFL that you do miss, those relationships with the players themselves, who are playing at the highest level. And, if you make it out here, you’d have to be blind not to see that. There’s still nothing imminent on the Kirk Cousins contract front. Contract situations brewing. There’ll be very little action over the coming weeks, as far as NFL business goes, with most of the league unplugging for the summer break. And really, pretty much anything that happens between now and camp will either involve (a) a run-in with the law; or (b) a contract negotiation. We can’t forecast much on the former, but we can help with the latter. And the biggest storylines in that regard involve a pair of quarterbacks. First, the assumption has been for some time that, before training camp, the Colts will lock up Andrew Luck with a deal that may well reset the market. From what I can tell, there’s no reason to believe that doesn’t happen. 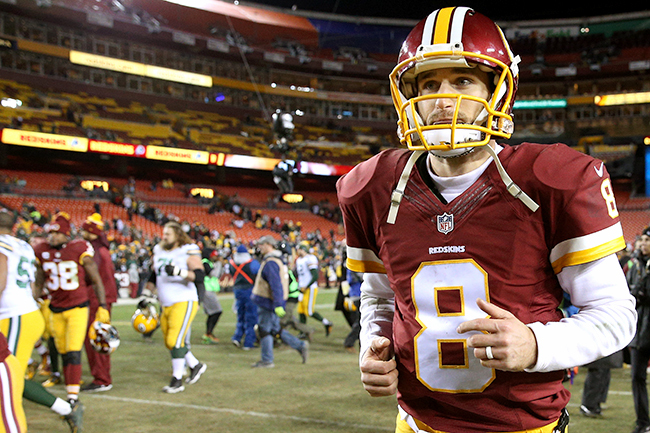 Far more complicated is the negotiation between Kirk Cousins and the Redskins. The assumption now, according to both sides, is that Cousins will play the 2016 season on his $19.95 million franchise tender. The Redskins and Cousins’ camp have spoken over the last week or so, and while talks remain amicable they’re going nowhere. The baseline, as Cousins’ side sees it here, is the $44 million the quarterback would get when you add this year’s tag and next year’s tag together, in the first two years of any new deal. Washington has basically communicated that it wants to see Cousins do it again before making that sort of financial leap. The risk for the Skins, of course, would be that Luck resets the market, Cousins lights it up again, and then they’re negotiating off a $23.94 million tag next spring. Add it up, and it’s not unlike the Joe Flacco situation in 2012. • WASHINGTON’S WIDE APPEAL: The pass-catching group in D.C. has it all. Is Kirk Cousins ready to pilot a breakout offense? Skins looking solid elsewhere. This is not an overstatement—Washington is ecstatic with the look of its team going into camp, and that’s a result of the development of Scot McCloughan’s first two draft classes. You can start with the second and third picks of the sophomore group. Preston Smith showed promise last year as an edge rusher, and will likely be moved around more this year, with coaches planning to use him to generate pressure inside as a 3-technique in the sub defense. Meanwhile, tailback Matt Jones should see increased work with Alfred Morris gone to Dallas, and he looks ready to shoulder that load. He’s settled in at 235 pounds, a little heavier than he was last year, having lost some fat and gained some strength and speed. And if you’re looking for a sleeper, 2015 undrafted free agent Quinton Dunbar looks ready to play corner after the staff spent last year converting the rangy 6-foot-2 athlete from receiver. As for this year’s group, cornerback Kendall Fuller, still not fully healthy, was lights out in the spring, and expectations are high internally for first-round receiver Josh Doctson, who didn’t get much work because of an Achilles injury. The Redskins have a tougher slate in front of them this year than they did last year, and they won’t sneak up on anyone this time around, but the belief here is that the 2016 group should be deeper and more versatile than the 2015 bunch was. A deeper Detroit. In 2014, Calvin Johnson, Matt Stafford and Ndamukong Suh accounted for $51.303 million of the $133 million allotted to the Lions in cap dollars, or 38.6 percent of their cap. Last year, with Suh gone, Johnson and Stafford ate up $38.279 million on a $143.28 million cap, or 26.7 percent of Detroit’s allotment. That, of course, was in part a product of old-system rookie contracts and second contracts reflecting the resulting leverage players had; and it’s also a top-heavy model that you won’t see under new GM Bob Quinn. Coming from New England, Quinn’s emphasis on building up the team’s middle class was evident to those in the building over the course of the spring. What the staff saw was a much deeper group (and in particular, great depth at tailback, safety and defensive tackle), to the point where getting the roster down to 53 will be much tougher than it has been in some time. So how did it happen? Two things are worth pointing to here. First, coaches were far more involved in the scouting process than they have been in the past, which makes sense given Quinn came from the coach-driven Patriots. One staffer estimated the pre-draft travel for coaches doubled this year over last. Second, as is the case with every personnel chief that comes from Foxboro, Quinn has led a more detailed, targeted process that emphasizes scheme fit (another reason coaches are involved) and leads to smaller draft and free-agent boards that are very particular in their desires. The Lions, of course, haven’t played a game yet, so we’ll see if this all works. But the early reviews internally of Quinn’s process have been pretty good. • LIFE LESSONS FROM CALVIN JOHNSON SR.: A lifelong Lions fans shares how a fortuitous seat assignment at a 2015 preseason game led to a conversation on fatherhood with Megatron’s dad. Smaller in scale? When I saw Kim Pegula’s comments this week about the challenges of building a new stadium in Western New York—“We’re not Atlanta, so it’s hard for us to say we’re going to build a stadium like Atlanta,” she told the Rochester Democrat and Chronicle—I immediately thought back to a potential solution that was on the table in Oakland (but ultimately scrapped). Then-Raiders CEO Amy Trask proposed the idea of a “microstadium” on the Coliseum land in Oakland, and was serious enough about the effort to meet with architects on it and price it. Ultimately, it didn’t happen, but the plan was fascinating: A stadium in the 40,000-seat range, two decks rather than three, and seats that swivel and have tablets attached. In a competitive sports market with another new stadium 32 miles away, Trask believed that being cutting edge and different, particularly with the Raiders’ proximity to Silicon Valley, was the right play. And as she saw it, she could keep costs down by not building a third deck (those are expensive and traditionally hard to monetize), and pass those savings along in making tickets more affordable. To me, if you’re a small-market team, the concept makes sense. Now, Buffalo has challenges the Bay Area doesn’t (weather, wealth), but making the stadium a different experience could help the team draw from Southern Ontario better, and give Western New Yorkers more reason to come out and brave the elements. Pegula said herself that the team is probably a ways off from breaking ground anywhere. But when the time comes, building a smaller, more intimate stadium might make a lot of sense. • A BILLS RECEIVER JUMPS TO THE OLYMPICS: With Rex Ryan’s blessing, Marquise Goodwin will go for gold in Rio. Tannehill has a chance to benefit from the Gase bump in 2016. 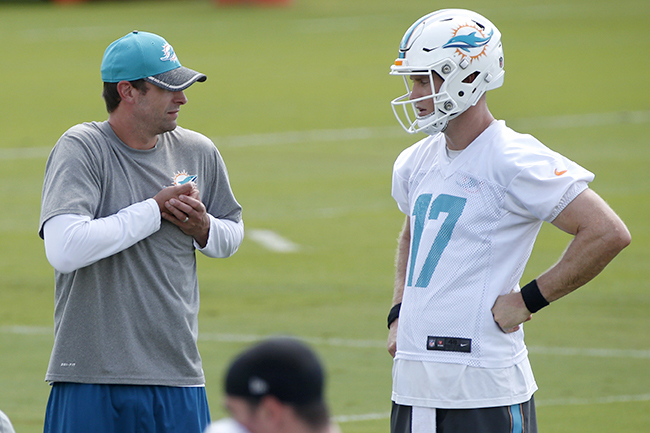 1) You’ve heard for a few years now that Ryan Tannehill is ready to make the leap. So I won’t say anything more here than tell you the Dolphins are pretty happy with his spring. And Adam Gase got a nice Year 1 bounce from Peyton Manning in his first year as Denver’s OC, and from Jay Cutler last year in Chicago. 2) Because I think it’s interesting to look back at these: Former NBA point guard Nate Robinson was a three-star recruit and the 33rd-ranked all-purpose back in America when the University of Washington landed him in 2002. And he started six games at corner as a true freshman Husky, which is nothing to sneeze at. Doesn’t mean the 32-year-old will get signed in his quest to make the NFL now. Does mean the effort isn’t a total joke. 3) And that makes this a good time to remember the kind of prospect now-three-time NBA Champion LeBron James was in football. Back in 2000, during my sophomore year at Ohio State, I remember hearing about him from a frat brother of mine—it was a word-of-mouth thing then, as in, “you gotta see this guy.” By the next summer, LeBron was everywhere. And I remember a college football preview magazine I picked up had among the Top 25 prep players in America: LeBron James, WR, Akron St. Vincent-St. Mary. And I asked around, and found out Jim Tressel took a stab at trying to convince him to play both sports at Ohio State. Seahawks LT Garry Gilliam. Russell Okung was the first pick of the Pete Carroll/John Schneider Era (eight picks in front of Earl Thomas), and he’s now gone, leaving Seattle (for now) without a concrete long-term answer to the question of who’ll protect Russell Wilson’s blindside. But in the short-term, at least, the answer is going to be Gilliam, who started all 16 games at right tackle last year. Undrafted out of Penn State in 2014, he has, at the very least, flashed the kind of ability that’d make Seattle think they have a find on their hands. “He has the athleticism you look for in a left tackle,” said one rival pro scouting director. “He possesses the physical traits you want. His big issue is strength and experience as an OL. He’s only been playing the position for four years—he was a tight end until his senior year at Penn State. … He’s gonna have his lumps, he struggled with speed-to-power rushes last year, and both [Arizona’s Chandler] Jones and [Los Angeles’s Robert] Quinn have the ability to generate power rushes using their speed.” How quick Gilliam is on the uptick—assuming Seattle doesn’t turn to a vet like Eugene Monroe between now and Week 1—could be pivotal for a team that’s squarely in a championship window, but will be remaking its offense after Marshawn Lynch’s retirement. • BIG SHOES TO FILL: Garry Gilliam is being tasked with filling one of football’s 12 biggest roster holes created this offseason. Cowboys DE Benson Mayowa. The Cowboys basically bought Mayowa on spec in March. By wresting him away from Oakland with a three-year, $8.25 million offer sheet, they bet that his modest production over three years (two sacks) will grow with increased opportunity (he only started three of 30 games with Seattle and Oakland). What they’ve seen thus far is a player with effort, speed, length and a team-first attitude, and he did get work with the first team in the spring. What they don’t know is how he’ll play in a bigger role, and that’s going to be important come September, with Greg Hardy gone and both DeMarcus Lawrence and Randy Gregory facing four-game suspensions. “He’s a tweener edge type,” said one AFC exec who has studied him. “He has some speed rush. He’s not a power player, not a heavy on-the-line or point-of-attack presence in the run game, but he possesses some athletic ability, initial quickness and length.” Reading between the lines, you can see how Mayowa’s handling of a heavier workload remains an open question, too. He had his knee scoped at the end of the offseason program, but is expected back for camp. This year, Cincinnati’s entire offense belongs to Zampese. One of the built-in challenges of winning is having to replace assistants who get the call to be head coaches elsewhere. And that’s a spot Marvin Lewis finds himself for the third time in as many seasons. Two years ago, it was Mike Zimmer leaving for Minnesota and Jay Gruden for Washington. 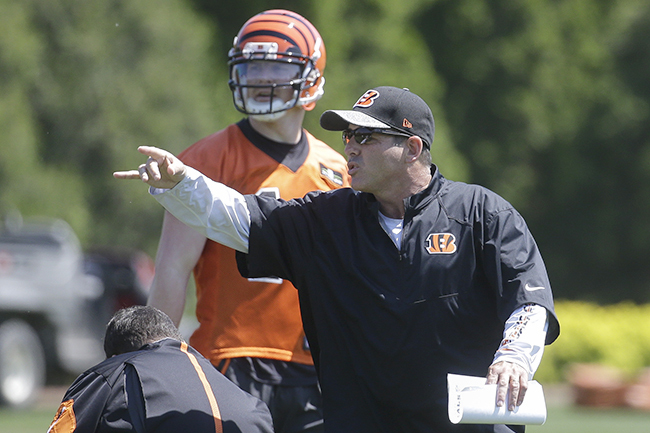 This time around, it’s Hue Jackson off to Cleveland, with quarterbacks coach Ken Zampese, who’s been with Lewis since 2003, replacing him. The idea here—like it was with Jackson replacing Gruden and Paul Guenther replacing Zimmer in 2014—is to refrain from fixing what’s not broken. And given how Lewis’s coaching tree is growing, it’s fair to say it’s not broken. Lewis isn’t the only one managing this kind of transition. Chicago’s Dowell Loggains and Kansas City’s Brad Childress were also promoted to run their respective offenses, with Adam Gase and Doug Pederson getting their shots at corner offices. With incumbent head coaches in each of these spots, the amount of change will be managed. And to illustrate how, Lewis leans back on advice he once got from Tony Dungy. “Sometimes, the guys just have to make a tackle,” Lewis said. “Tony Dungy told me that back in the spring of 1997, that was my first year as the coordinator in Baltimore. ‘Marvin, sometimes, they just have to make a tackle, whether it’s second-and-3 or first-and-10.’ You can’t worry about all the what-ifs. You gotta have a sound system, you have to believe in your system, and then the players gotta go play. Yes, the bar has been set pretty high, with Cincinnati having topped 26 points per game and ranked Top 10 in scoring in two of the last three years. But that’s why it made sense for Lewis to look to Zampese in the first place. He doesn’t have the playcalling experience Jackson had going into the job two years ago, but few know the roster and the philosophy better than Jackson’s replacement does. And that will allow him to tweak and change things in a smart way, without flipping over the apple cart. “His expertise, his vision of the offense—any time you get an opportunity to put your hands on something you’ve been a part, you get a chance to push it in new directions,” Lewis said. “He’s the guy who knows the quarterback better than anybody, the guy the offense is built around. … Obviously, the offensive playcaller is able to put his own spin on things, and put his own direction on it. He’s a bigger part now with all 11, not just Andy Dalton, under his oversight on Sundays. But as well as Gruden and Zimmer have done elsewhere, the train kept rolling the last two years, so the expectations aren’t going to change now.